An official state investigation into bad behavior opened the floodgates. Apr. 25, 2017, 6:00 a.m. The last two weeks have been pretty miserable for Lt. Gov. Mike Stack, the Philadelphia politician who — along with his soda-throwing wife, Tonya — has been accused of mistreating state employees and using taxpayer dollars to cover questionable expenses. Since April 10, there’s been a steady drumbeat of bad headlines revolving around Stack, the former state senator from Northeast Philly. So what’s it all mean for the political futures of not only Stack, but also Gov. Tom Wolf, the Democrat who’s in the midst of a bid for re-election? Political watchers in Pennsylvania have said we’re in “uncharted territory” and pointed to the fact that it’s Wolf who ordered a state investigation into Stack’s treatment of state employees in his police detail and home. And it was Wolf who decided to yank Stack’s State Police detail entirely. Pennsylvania Inspector General Bruce Beemer arrives at the trial of former PA Attorney General Kathleen Kane. One complaint involves the Stacks ordering troopers to use lights and sirens while traveling in non-emergency situations, which is against Pennsylvania State Police policy and a violation of the vehicle code. When troopers refused to obey the Stack’s commands, they were verbally berated with expletive-filled language, especially by Tonya Stack, ABC27 has learned. Sources told ABC27 that the investigation was near completion. The Office of the Inspector General is tasked with investigating fraud, waste and abuse at the state government level. It’s unclear if the Inspector General’s report will be made public, but ABC27 reported Wolf will receive a full report on what the Office finds. Throughout the day on April 10, other news organizations confirmed the existence of a probe into Stack’s behavior. All said the alleged verbal abuse was reported by multiple Stack employees. As you can see in the above video, Stack held a rare press conference in his own office two days after the first reports came out that detailed his and his wife’s alleged mistreatment of state employees. Stack said he sometimes snaps “in anger and frustration” and offered an apology during an “unusual” news conference, The Inquirer and The Pittsburgh Post-Gazette reported. But Stack stopped short of revealing anything he or his wife actually said to the employees, instead painting the transgressions as part of his fiery personality. 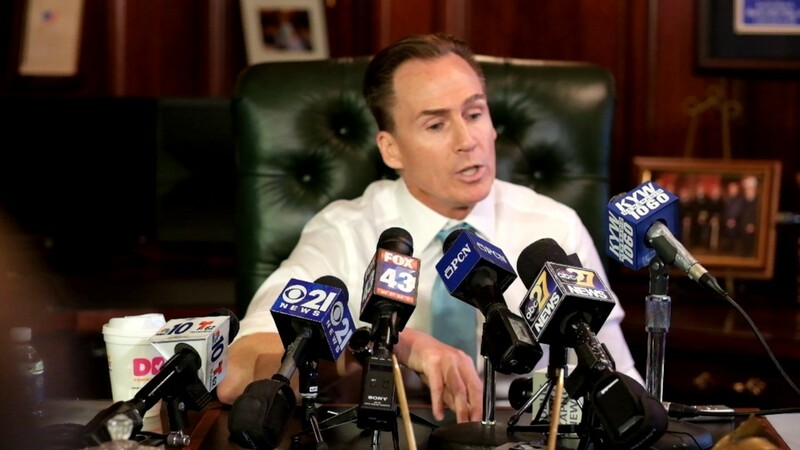 Lieutenant Governor Mike Stack in his Philadelphia office. Sources told reporters at The Inquirer and The Pittsburgh Post-Gazette that aides who work for Wolf had notified Stack on numerous occasions that employees — both state troopers and those who worked at his residence — complained of how they were treated by the Stacks. The complaints reportedly continued; Wolf then asked the Office of the Inspector General to launch an investigation. The Department of General Services, which oversees the mansion in Fort Indiantown Gap that’s afforded to the lieutenant governor, told PennLive that “what once was a five-person crew at the so-called ‘State House’ has been reduced over the course of the last six months to one full-time maintenance/repairman.” The Department didn’t release other details about what happened with the four former employees at the Stack residence, citing personnel issues. Pennsylvania Lieutenant Governor Michael J. Stack addresses the crowd at the 2016 Memorial Day Event in Fort Washington. As if an official state investigation into Stack’s behavior wasn’t enough, The Inquirer and The Post-Gazette reported last week Stack billed the state in 2015 for thousands of dollars in hotel stays in the city of Philadelphia — while he owned a home here. Stack apparently tried to expense $4,210.69 in Philly hotel stays between January 2015 when he first took office as lieutenant governor and February 2016 when he sold his home in Northeast Philly. Then, Wolf administration officials actually asked Stack to pay back $1,800 dollars of that. In 2015 and 2016, Stack expensed more than $18,000 worth of travel costs — about half of which was for hotels and meals in Philadelphia. Another fun nugget in this story? Stack is still registered to vote in Philadelphia, even though he insists he lives in Lebanon County now at the state-provided residence. His chief of staff told the Inky he uses his mother’s address for his voter registration which is, oddly enough, allowed under state law. April 20 – Trying to avoid Eagles traffic?! One instance followed a Philadelphia Eagles game that Mrs. Stack attended in Philadelphia. She allegedly wanted to avoid postgame traffic by using lights and sirens. Her assigned trooper refused. Tonya, according to sources, got angry and left the car. She called headquarters in the Midstate and asked that a different trooper come from Harrisburg to Philadelphia to pick her up and bring her home. Gov. Tom Wolf, center. delivers his third state budget address. He's flanked by Speaker of the House Mike Turzai, left, and Stack, right. “After consultation with the Commissioner of the Pennsylvania State Police and the Secretary of General Services, I write to inform you that, effective immediately, you and Mrs. Stack will no longer be afforded the protective detail provided to you as a courtesy of the Pennsylvania State Police. In addition, the Department of General Services will provide limited cleaning, grounds keeping and maintenance at The State House and only under supervision at prearranged times. City and State PA reported that on top of alllllllll that, Stack in 2015 tried to bill the state $240 for two tickets to see an IndyCar race at the Pocono Speedway. He was denied, but at least he had fun.